Marion County was organized on July 6, 1865, by George Griffith; William H. Billins; William P. Shreve; Reuben Riggs; A. E. Case; and A. A. More. The county was named for General Francis Marion, Revolutionary War hero, and contains the cities of Peabody, Tampa, Lincolnville, Ramona, Durham, Florence, Hillsboro, Lehigh, Lost Springs, Marion, Burns and Goessel. Although based in fact, many stories of legendary proportions surround the area of land one section wide and eighteen sections long along the east boundary of the county. A murder had been committed in the area and Marion County did not want to have the trial so they gave those sections to Chase County to make certain the murder had occurred in that county. 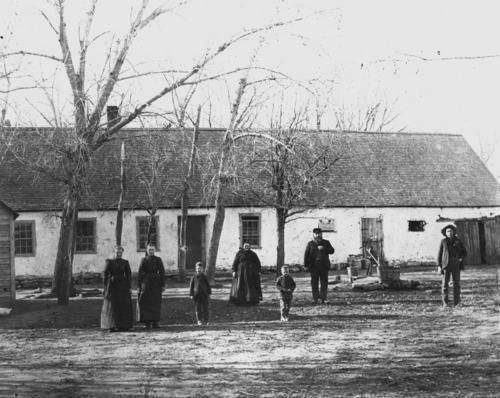 The immigration of Mennonites from Russia in 1874 and their purchase of vast acreages of government and railroad land; and the large purchases of land by William Scully, of Illinois, between 1870 and 1885 and his introduction of the Scully land system, which included tenant farming and drain tiling the fields, both helped the early settlement and development of the county. The Scully estate still owned 53,491 acres in as late as 1942. The Marion Methodist Church was organized in 1869. The Presbyterians at Marion had the first church building constructed in 1871, and is still being used. The first county fair was held October 13, 1875 , at Peabody. The present fair board and system began in 1931 and conducts an annual fair in Hillsboro. The first school district, Number 1, was organized in 1865 for the entire county and also included everything west to Colorado and south to present Oklahoma. Jim Lehrer (of the MacNeil-Lehrer "Report") wrote We Were Dreamers, based on Marion. Esther Vogts' several children books are about the county and the Hillsboro area. Ed Burkholder's The Story of Charley Faust, is about Faust who played for the New York Giants baseball team. Interesting sites in the county include the The Marion County Courthouse, the The Elgin House, the Harvey House (the first one), and the Adobe House. For more information see the Marion County website. There are public records at the courthouse. Also, the Adobe House Museum, the Harvey House Museum, Tabor College Library, and the Peabody Library and Museum all have historical source materials available for use.